It’s no secret that Himalayan salt lamp has become the darling of interior decorators and designers. That in and of itself isn’t surprising at all. A decorative salt lamp can bring divine harmony, beauty, and style to any room. Whether you want to add some pizzazz to your bedroom, breathe more life to your living room or create an oasis of serenity in your bathroom, these lamps will simply knock your socks off. Decor and novelty lighting uses aside, Himalayan salt lamps have gained traction in recent years for their healing properties. They are now touted as these energetic and elegant lamps that can do wonders for every facet of your health and well-being, including curing asthma and other respiratory condition. Needless to say, this has aroused lots of tongue-wagging among the naysayers. That’s why we have put together this article to clear the air. We’ll cover everything you need to know about these amazing decor pieces, as well as explain how they help with chronic diseases of the lung, such as asthma and bronchitis. To finish off, we’ll tell you how to pick out the picture-perfect lamps for your home. Let’s Start Off With the Obvious … What’s Himalayan Salt Lamp? This is a lamp that’s made from a carved out pink crystal rocks that are mined at the edge of the Himalayan Mountain. The genuine lamps are often handcrafted by artisans using chisels and other artisanal tools. The salt rocks themselves are soft pink with radiant pinkish orange owing to high levels of trace minerals in them. Any light bulb can be inserted in the hollowed out middle of the pink salt to illuminate the room, add a pop of color, and generate a little heat. The complete setup is truly quite a sight to behold. Turns out, these salt lamps does more than add elegance and functionality to your living space; there are myriads of reported benefits of having them in your home. 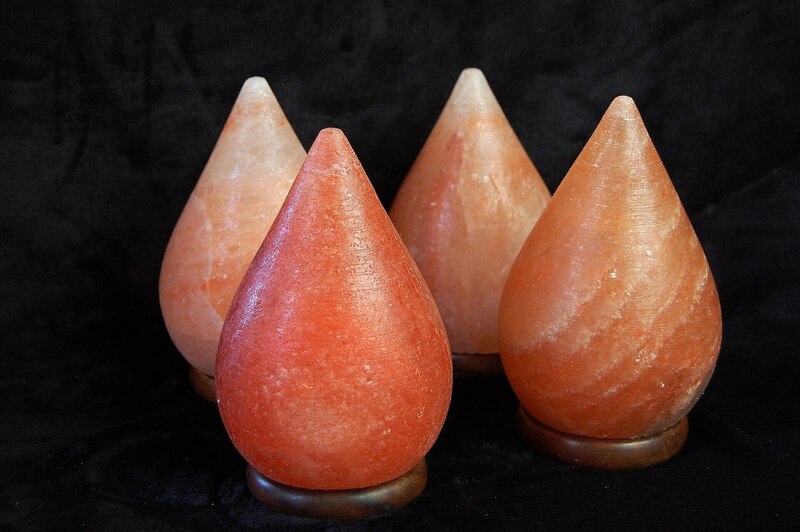 Even better, there are a ton of salt lamps on the market, and they come in all sizes, colors, styles, and price tags. There’s always something that’ll suit your budget and personality. How Does a Decorative Salt Lamp Work? A Himalayan salt lamp might be alluring to look at, but the science behind how it works is even more fascinating. It’s the traces of rare minerals that actually radiate giving off that pink glow that’s quite beautiful. The bigger question, however, is: how does it help with asthma? It all starts with water vapor that’s dancing in the air around you, which unfortunately is jam-packed with allergens like smoke particulate (odor), gems, pet dander, mold, pollen, dust, and even viruses. These are air pollutants that often aggravate asthma, bronchitis, allergies, and other respiratory complications. That’s where your charming decorative salt lamp come into the picture. You see, the pink salt has amazing hygroscopic properties (a fancy way of saying it attracts moisture in the air). Remember that these lamps are made out of large blocks of rock salt crystals, meaning that they’ll attract a copious amount of water vapor alongside air pollutants trapped in them. What happens eventually is that all these compounds get attached to the surface of the salt lamp, cleaning the air of allergens that can cause asthma flare-ups. What’s more, when the salt becomes saturated with moisture it has attracted from the surrounding air in your room, the heat radiating from light bulb inside causes water vapor to evaporate back to the atmosphere leaving the contaminant behind. The hygroscopic cycle then begins. This goes on and on again as long as the salt lamp is switched on. That’s the beauty of these fabulous lamps: they continuously purify the air, leaving your rooms allergen-free and conducive for asthma suffers. Of course, the airborne pollutants will gather as dust. As such, you need to wipe your lamp at least once every couple of weeks using a clean, damp cloth. Any other time, don’t worry about it – leave it switched on, and it’ll do its magic against asthma aggressors. Of course, that isn’t all there is to Himalayan salt lamps when it comes to treating asthma. Lots of positive ions in the surrounding atmosphere can usurp your body of vibrant energy. The good thing is that Himalayan salt lamps can help neutralize them by pumping negative ions into the air. Of more importance is that these negative ions can do wonders for your energy level in your body. In fact, it is for this reason that salt lamps are known to have a rejuvenating and invigorating effect on your mind, body, and soul, something that can improve the quality of life for asthma suffers. Recent studies seem to suggest that negative ions, like those emitted by a salt lamp, can help stimulate a healthy flow of blood. Given that asthma suffers often struggle with circulation issues, having a handful of decorative salt lamps can be especially helpful. As if that isn’t fabulous enough, improved circulation can help curb cardiovascular diseases like heart attack, stroke, and prevent damage to the lungs. Suffering from bouts of asthma can take a toll on your happiness and mood. Thankfully, salt lamps can help. Several studies have shown that the presence of negative ions can help boost mental energy levels as well as lift up your mood by encouraging happy centers in the brain to secrete more serotonin. This is the hormone that brings about what is known as “happy feel” which can benefit people with asthma, depressive problems, and seasonal affective disorders. It also doesn’t hurt that salt lamps bring harmony, serenity, and sense of wholeness to your living spaces. Exposure to too much positive ions in the environment can hamper your oxygen supply and blood flow to the brain, which can make it hard for asthma suffers to fall asleep and enjoy a regular sleeping pattern. By neutralizing positive ions, a Himalayan salt lamp can be a great sleep aid. The soothing glow from the lamp that can also help you sleep better, and prevent insomnia. Now that you know a decorative salt lamp can indeed help with asthma management … it’s high time you shop for the right for your style. Ensure you’re buying the real thing: Real salt rock lamps are carved from genuine salt rocks extracted at Khewra Salt Mine. Here I would suggest you to go Fab Glass And Mirror to buy Real Himalayan Salt Lamp. Get the size right: if you’re looking for salt lamps for your bedroom, make sure that they aren’t too conspicuous. Not all vendors are created equal: ask for referrals, recommendation, and read online reviews to find an authentic vendor that’ll sell you something durable and genuine. Don’t forget about your interior decor: Choose a color and pattern that marries well with your home’s decor and style. No one can deny the beauty of the Himalayan salt lamp. It also happens to be the most eco-friendly, novelty lighting for a modern home. Knowing that it can help cure asthma makes it something of a holy grail.